It is lonely out here, 850 km east of Christchurch, New Zealand, a small archipelago unprotected from the Roaring Forties. Even the international date line carefully avoids it, bending around it to the east. Few people live here; of the eleven Chatham islands, only two are occupied: Chatham island itself, and Pit island. The bending of the date line keeps the locals on the same calendar as their owner, New Zealand. Still, there is an independence of spirit, if not politically: they keep the clocks 45 minutes ahead of New Zealand time. But the isolation tells, and the population is now only 600 people, down from 750 just 20 years ago. Evidence of the New Zealand influence, sheep far outnumber people. Chatham island is about 40 km across, with a elevated plain on one side and a lagoon covering a quarter of the interior. A lot of the land is low rolling hills. A series of volcanic plug exist in the north but they are old and not large. Most spectacular are the basalt columns on the northwestern coast, 80 million year old which can only be visited by permission from the private owner. 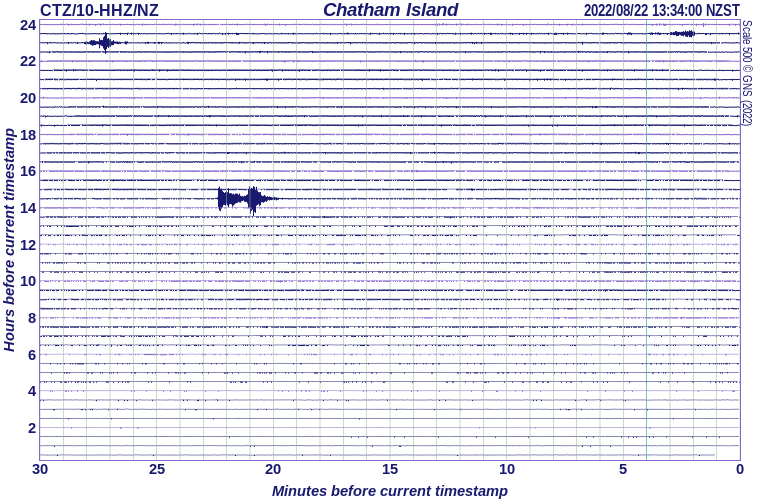 Pitt Island, 22 km southeast of Chatham Island, is less than a tenth in surface area and more rugged although the highest point is lower than that of Chatham Island. It is best known as the most easterly inhabited point west of the date line. That makes it the first location on Earth to see the sunrise on the equinoxes. Pitt Island is named after an Earl of Chatham. The other 9 islands are little more than isolated rocks, with a variety of interesting shapes. The elevations are low: nothing on the islands exceeds 300 meter. The climate is oceanic, with rather little difference between summer and winter. The winters are rainy, drizzly, misty and stormy. The summers are drier, and sunnier (compared to, say, Iceland). The amount of rain is not that large, but there is little relief and the drainage is not good; it leaves peat, lakes and ponds covering much of the habitable land. The peat layer is 10 meter thick in places and covers most of Chatham Island. The isolation tells in the natural life: 47 of the 388 types of plants and trees are endemic. The local Forget-me-not is a particularly famous shade of blue. There are also 8 endemic species of birds. The archipelago sits on a rise of the sea floor, called the Chatham rise. It came above the surface only 4 million years ago. There is a rule that says that all deep sea islands are volcanic in nature. That is not quite true here. Although the ground is indeed volcanic mixed with sediments, in spite of its oceanic location this is not deep sea. In fact, it counts as continental – possibly among the most isolated examples of continental crust in the world. It is actually the remains of an oceanic island arc which became part of a continent, so going back long enough and in a way the rule does hold. Underneath the sea, the raised plateau runs from near Christchurch to just beyond the Chatham islands. 100 million year ago, it was above sea and this was part of Gondwana. Even at that time it was hardly a central location: the area was an accretionary arc which was plastered onto the edge of Gondwana. Before the break-up of Gondwana, a subduction zone existed just to the north, and a spreading rift began to develop just to the south. Neither of these worked well. The subduction tried to subduct a plateau that was too buoyant to subduct and it became blocked, having swallowed more than it could digest. Even subduction zones can be too greedy and overfeed. The rift also failed to develop further, but it left a volcanic legacy: it caused intra-plate volcanoes which erupted basalt. After the break-up of Gondwana the underlying mantle cooled and the land of the Chatham rise sank below the sea. The volcanoes became submarine, surrounded by non-tropical reefs. From 80 million years ago, there was only sea. 30 million year ago, volcanism restarted, for reasons not well known. The volcanoes were strictly submarine. But 5 million year ago the Rise began to rise, and two to three million year ago, faulting brought the eastern end of the Chatham rise back to the surface and the Chatman islands formed. The volcanism ceased at around this time: the last eruption was just after the land had breached the sea. After this the Chatham Rise became inactive. The geology of the islands shows the Gondwanan rocks, as old as the dinosaurs, and thick limestone cliffs from the carbonate sediments. Although there is no recent volcanic activity, here are some tephra layers. The best one comes from the 27.1ka Kawakawa tephra from Taupo, and there are also some deposits from the 345 ka Rangitawa tephra, also from Taupo. Tectonic uplift is still continuing, but at a very low rate of 0.1 mm per year, which means that it can no longer keep up with the sea level rise. 2008, PhD Thesis, Massey University. The southern, elevated part of Chatham Island is the remains of an old shield volcano, dating from the Gondwana activity. The remnants of the younger volcanics can be seen as low hills on the northern part of Chatman Island, and elsewhere in the archipelago. The small islands, mostly south of Pitt Island, are little more than rock stacks sticking out of the sea. The most impressive is The Pyramid, 174 meter tall. 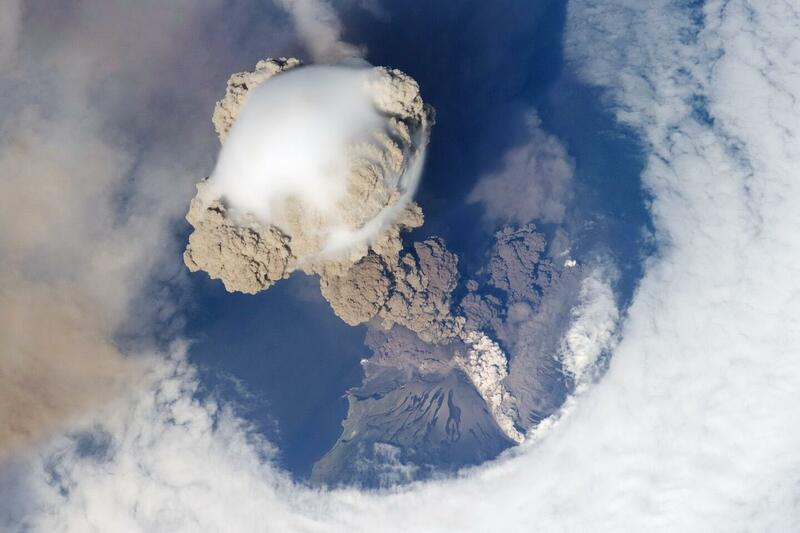 It may be the youngest volcano in the archipelago, dated to 2.6 million year ago. Only the volcanic plug remains. The Pyramid is an inaccessible place. The steep sides are uninhabitable, too slippery and steep to be easily climbable, and the weather rarely allows for landings. It is heaven for sea birds, and one in particular has made it its home. The Chatham albatross is a lonely outcast in this lonely place. It lives nowhere else in the world. And even in the Chatham islands, this subspecies of the Shy Albatross only breeds on The Pyramid. There are about 5000 breeding pairs, all lonely together on this single rock. They live mainly on the east side of the Pyramid, sheltered from the roaring westerly storms, especially the waves which can swamp the lower levels. A bit of soil has collected here over time, and they use it for their nests. But it is dangerous to be dependent on such a singular place. In 1985, an unusual storm hit the wrong side of the island, and the enormous waves removed much of the vegetation and the soil. The birds recovered, but it shows the dangers. Birds endemic to islands are invariably at risk. At least six species have gone extinct on the Chatham islands since people first came around 500 years ago: two rails, one flightless duck, one raven, one penguin and a fernbird. The local black robin just survived. Even the most isolated pace has history. The Chatham Islands are the outpost of Gondwana, resurfaced to keep the memory alive of the supercontinent to which it briefly belonged. Look hard and you find a volcano that formed on Gondwana, other volcanoes that formed more recently during the rise back to the surface, and tephra coming from the most prolific volcanic zone on Earth, Taupo. Out in the ocean there is the eroded remnant of its most recent volcano, now home to an endangered species which breeds nowhere else. The Earth is not always a friendly or homely place. But it can teach us ancient history wherever we look. Another brilliant and fascinating post Albert! On another note, Karymsky is erupting again. Lived in Curry county on Oregon’s south coast. Much like Chatham Islands there are more sheep than people…. The 580’s are still used by Buffalo Air as a combi type airliner in the Northwest territories and the Yukon by Buffalo air. Thank you Albert. another Post I have enjoyed. Little islands. Little corners of the world where people and wildlife live and despite all the Googles ,Ipads,TV etc so few people are aware that 1) These little corners exist and 2) how interesting they are both now and a remnants of our past. As for Mount Aso. I liked this news report even though I don’t understand Japanese. The report made clear what problems there are living near a volcano! I understood pretty much all of of what is happening there and feel for the locals! That dust mixed with rain must be a nightmare. Thank you Albert for a highly entertaining and informative post. I love the Pyramid, so desolate and majestic. Thanks Carl. I am glad to hear you have recovered. Nothing like a good old pyramid for some healing. Interesting read part translated the whole article can be found on the link below. It is in Spanish and will need translating. Thank you very much for this very interesting post! As I am particularly interested in lesser known volcanic areas I really liked reading about Chatham Island! The double-blips showing at the moment are P and S waves from the aftershock sequence following the M7.1 quake near the East Cape of the North Island a few weeks ago. As well as some reasonable size aftershocks (M5.8 yesterday) there’s a slow-slip “silent quake” thing going on in that area. El Hierro joining in the fun. Anyone heard any news from Pensacola? Still here. Still no tephra. Still warm and sunny. Any sharks out of that hurricane? Good to hear you are allright. The only sharks I saw were a convoy of tree service trucks coming out of Texas. They were headed to Florida’s east coast to feed on the insurance claims. Aside from the shark pack, I did spot several Gulf Power line trucks milling about at mile marker 17, sitting around waiting for someone to give them direction as to what to do next. A couple of FHP were sitting nearby jawing with ECSD near the old Westinghouse plant. (Now a GE plant that makes bird chippers). On the run out to mm 127, ran across a higher than normal collection of FHP sitting about minding the traffic, which was fairly low given what was rolling up the coast and the sheer magnitude of hype fest about it. Yet again, the media over played the storm. Yeah, it was a potentially gnarly storm, but with all the frantic bleating about it, and nothing anywhere near what they were claiming coming about, they are gonna wind up getting someone killed when they issue their next dire warning and no one listens. On my return trip, I noticed that traffic moving west bound was lighter than normal, eastbound looked about typical, though there were sproadic bucket trucks and flatbeds loaded with telephone poles headed east. It’s not uncommon to see Electric company service trucks from across the south east headed into a storm threatened area. Part of it is a cooperation agreement, the other part is most of those electric companies are subsidiaries of Southern Company. I am happy that it had calmed down somewhat before hitting Florida. It was pretty ghastly over at Haiti. Saw something recently on TV about the Chatham Albatross. In an effort to avoid them being wiped out a group of chicks have been moved to another Island. The hope is that when they are ready to breed they return to this island instead of the Pyramid.